And now for something completely different! 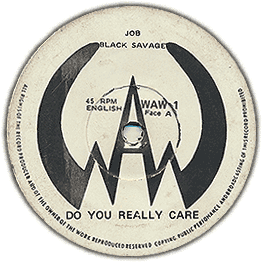 The Black Savage group, famous for the rare mid-70s EMI LP. The band line-up featured one prominent member; Job Seda, better known as Ayub Ogada (later released an album on Peter Gabriels Real World label) In a Pink Floyd-esque landscape these two tracks are oddball and unique enough to go unnoticed. Completely without any noticeable local rootings, except the lyrics. There is an uncanny quality over them and both songs complete with anti-hunting lyrics “Save the Savage, don’t shoot ’em down, they are trying to survive, they have feelings too…You know people, I think it’s very strange. How would you feel if someone was wearing your skin, or wrapping it around their feet, have you ever stopped to think, that all these animals all over the world, you know they have feelings too, bet you never thought of that, there you go shooting them down hanging them up on your wall to hide the cracks!”. Thanks to Jumanne Thomas for finding the tunes! Another goodie from Santa Loi-Toki-Toki Jasta, a lovely tune with mod feeling. Check the superb organ & guitar solos. 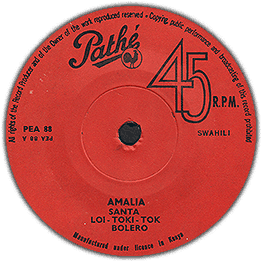 They recorded several funky pop songs such as ‘Ware Wa’ or ‘Lakusema Mimi Sina‘ on Pathé, and one 45 on Angel, which is a bluesy, melancholic afro-ballad with deep wah-wah guitar licks. Very unique sounds. 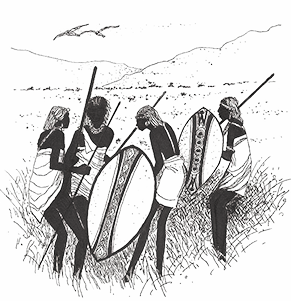 One of the most distinct bands from Kenya.